On a recently completed two-week Alaska cruise that stopped twice in Skagway Alaska... we discovered a simple way, of spending five dollars apiece, and seeing most of the sites in and around town. 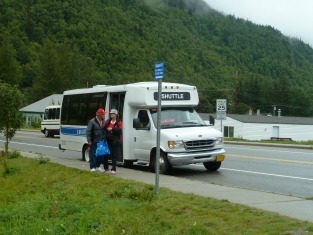 Compare that, to the cruise ship passengers which paid $129 apiece, to ride the White Pass and Yukon narrow gauge railroad...It would've been a nice trip if it had not been so cloudy... but visibility was very poor on both days it we visited. Even with three or four cruise ships in port, there were plenty of seats available on the train that leaves three times a day... much better to wait and see if the weather is clear before you plunk down your $129. The people that went on this expensive shore excursion were very disappointed since they could not see anything due to the poor weather. The cruise ships of course will tell you to book early due to the possibility of this very popular train being full. You may want to consider this trip, if the weather is clear, buy your ticket then and only then. What we did twice, and recommend you do as well, is purchased the five dollar all day pass on the smart bus. This enabled us to go back to the ship for lunch, return to town, in the afternoon... we saw it all. Tell Tyler, the friendly smart bus driver, https://www.frugal-retirement-living.com said hello. Go to the National Park Service office located on first Street, watch a free film showing the hardships of the fortune seekers that rush to the Klondike in the late 1890s... well were seeing, and free. Then every hour on the hour, a park ranger will take you on a 45 minutes to one hour tour of the town, it had some real characters that you will enjoy hearing about as you take a short 3 to 4 block walk... also free. 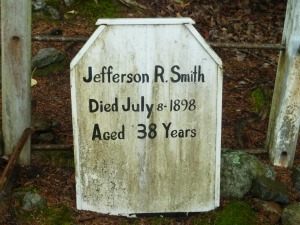 Here is the grave of a real character you will hear about on the tour...this guy was a real piece of work. I don't want to give away the entire story... but the grave of the fellow who also died in the same gunbattle... has a much nicer monument... and leads to some beautiful waterfalls named after him. So for $10 my wife and I saw all the frugal Skagway sites and then some, in did not have the disappointment of taking a scenic train ride that the weather made impossible to enjoy... at $129 per person.